You can leave a dinghy on its dolly at the beach or in a boat park or marina and transport it by road on a trailer. For peace of mind and for everyone's safety, the boat should be tied down as securely as possible, with top and bottom covers for maximum protection. 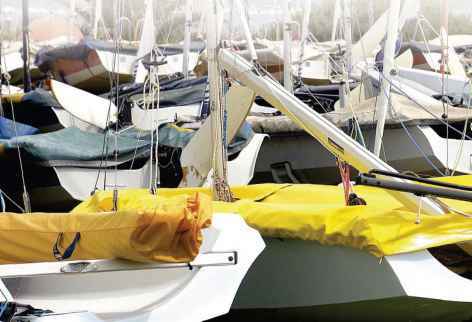 When leaving a dinghy unattended, you may need to remove sails, foils, and all loose fittings—dinghy gear is expensive to replace and theft does unfortunately happen. Pull halyards tight before you leave the boat—when it is windy, people do not want to hear the unpleasant noise of wires banging against aluminum masts. Leave the drain bung open to allow air to circulate inside the hull. It makes good sense to remove the bung or carry spares, in case a neighboring boat owner decides to "borrow" it. Always use a good-quality top cover to protect the dinghy from ultraviolet light and rain, and make sure it is securely attached to the boat—a "boom-up" design will help drain rainwater away from the dinghy. A bottom cover will provide further protection from damage and is always recommended when transporting a dinghy on a trailer. 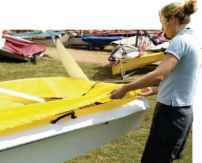 Dinghies can get blown over by strong winds, so tie your boat down to ground anchors as an added precaution. 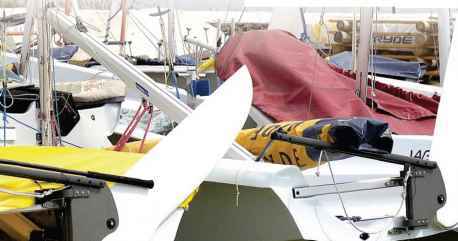 Beware of neighboring boats getting blown onto your dinghy in particularly windy weather. It is well worth making sure that your insurance policy covers this kind of accident. Use a cover that will provide full protection from ultraviolet light and rain, with under-hull straps to ensure it is securely held in place. You can transport a dinghy by loading it on to a purpose-made trailer, which you attach to your car. Modern combi-trailers allow the boat to stay on its trolley, which slides on and off the road base. Check the light board is properly attached and fully functional. The dolly must be locked to the road base and the trailer locked on to the tow hitch with an additional security wire. 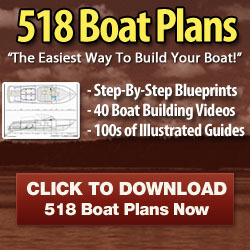 Ensure that the boat and mast are securely tied down. Any loose equipment, such as the boom, should be taped or tied in position for safety reasons. Put padding (carpet or thick rubber) under ropes, straps, and the mast base to prevent rubbing and abrasion. Always carry a spare trailer wheel and a set of tools in case of a puncture or bearing failure. Check the trailing regulations governing the weight, length, and width of the trailer. 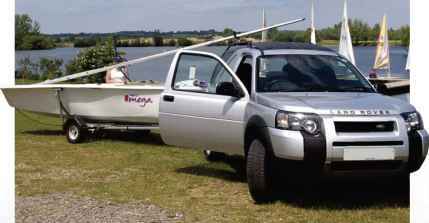 When transporting a dinghy, make sure that the mast will clear the roof of your car and there is no large overhang at the transom. Bow-down is the most stable position in which to store your dinghy, but bow-up will allow rainwater to drain out through the transom or bung holes. How to store a sailing dinghy?